• Dynamic power infrastructure able to closely align power capacity required by rapidly growing ICT businesses. 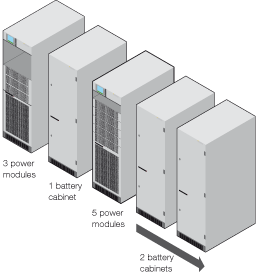 • Fully modular architecture based on power and battery modules. • Less complexity for system deployment with repeatable hot pluggable and hot swap modules. • No risk of downtime to upgrade power capacity or battery capacity. • Superior availability during normal operation and even under maintenance by using redundant and independent components. • Self-diagnosis both at module and system levels, remote monitoring and alert capability to manage operational paramaters in real time and decide when an upgrade is necessary. • Power granularity to deploy the right number of modules and get all the necessary power protection at the right time. • Extensive upgradability to maintain maximum power quality and manage costs simultaneously from now on. • Reduced complexity, enhanced serviceability, and responsiveness in the case of module failure for a very low MTTR (Mean Time To Repair). • Modularity and energy efficiency design meet the new ROI (Return Of Investment) metrics perfectly, based on TCO that incorporates initial investment, full lifecycle infrastructures and facility costs. • Energy efficiency means reduced energy losses, electricity operation costs, heat dissipation, cooling resources required and operational costs: resulting in significantly lower energy bills. 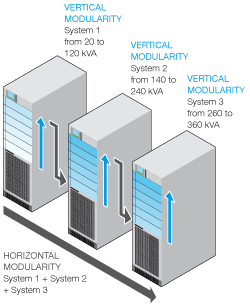 • Modularity minimises capital and expenses: no prior expenditure required for spare capacity or additional installation costs for future extensions. Modulys Green Power suits perfectly, either with unscheduled site upgrades or upgrading in successive steps, thanks to its modularity. 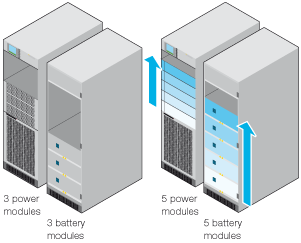 Maintain equivalent autonomy while power increases with the modular battery cabinet. Autonomy range: from 10 to 60 minutes. Provides very high and scalable autonomy with the high capacity battery cabinet. Autonomy range: up to 120 minutes. Modulys Green Power integrates network management functionality to enable supervision of the UPS by connecting it directly to the LAN. 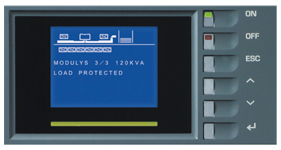 Multilanguages LCD graphic mimic panel with multicoloured luminous bar to monitor the system and condition of the power supply.